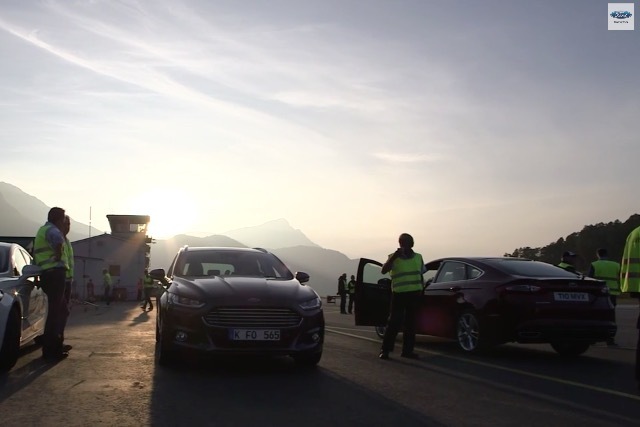 Ford Motor Company is releasing an action-packed pan-European TV ad created by 'The Fast and the Furious' director Rob Cohen, with the company's new Mondeo's LED headlights guiding a plane to land on a darkened airstrip. The campaign will initially break on social media and is designed to showcase some of the smart technologies featured in the new Mondeo. Features on the new Mondeo include a collision-avoidance system that helps drivers park and avoid other cars and pedestrians and LED lighting that adapts to driving conditions. The car also features the vehicle's voice-activated connectivity technology which responds to oral prompts: for example, if a driver says "I’m hungry" the car will identify nearby restaurants. The full 60-second ad makes its debut in Ireland on 3 November and breaks next week on TV screens and cinemas across mainland Europe. It will be broadcast in the UK from late December. The film shows a new Mondeo coming to the rescue of a plane that is unable to land because an airfield has been plunged into darkness. The car uses its LED headlights to guide the plane in by racing along the darkened runway. Ford has released a teaser video that hints at the action to come. The automotive firm has also released a behind-the-scenes film in which Cohen talks about some of the challenges of making the ad and finding "the most dangerous-looking airstrip in the world" in Norway. The film was shot on location in Sandane, Norway, using a 60-strong crew, a professional stunt driver and stunt pilot. Cohen and Ford insisted on not using CGI to film the ad which meant that the plane landed right over the car in real time. Cohen said: "There’s no substitute for real. CGI can approach real but it can never achieve real. We’ve gone to great pains to film this commercial on camera." Roelant de Waard, Ford of Europe’s vice-president of marketing, sales and service, said: "Our customers hopefully won’t need to help landing a plane using Ford Dynamic LED headlight technology, but we believe they will appreciate the difference it makes in their daily lives." The film was conceived and produced by Blue Hive and is part of a fully-integrated marketing push for the Mondeo, which goes on sale later this year. Licence to sell: is Bond's new-found taste for Heineken a brand-movie tie-up too far?